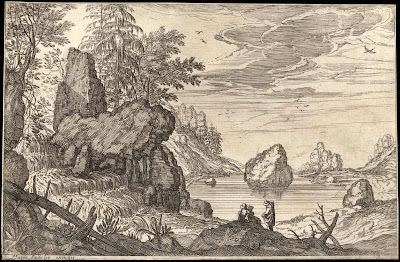 What are some of the principles that help artists portray a vast landscape scene? 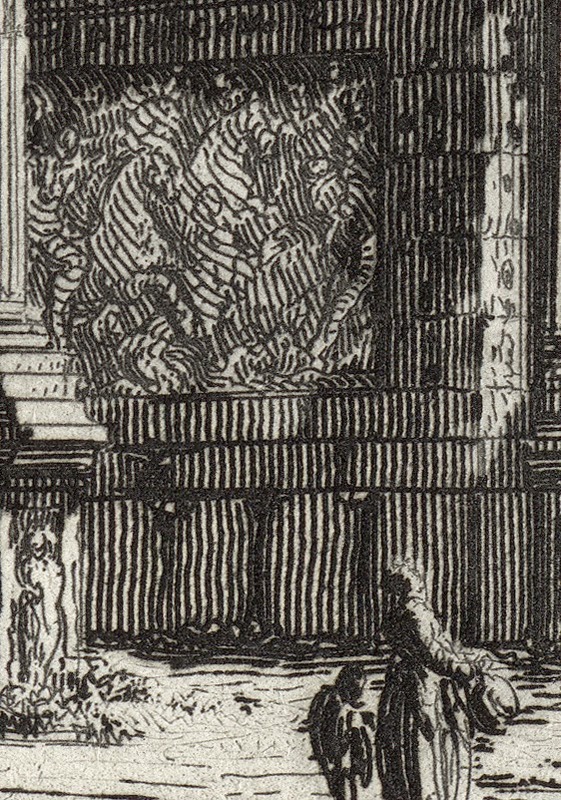 use of the keyhole illusion to connote disjunction of spatial realms within a portrayed scene. 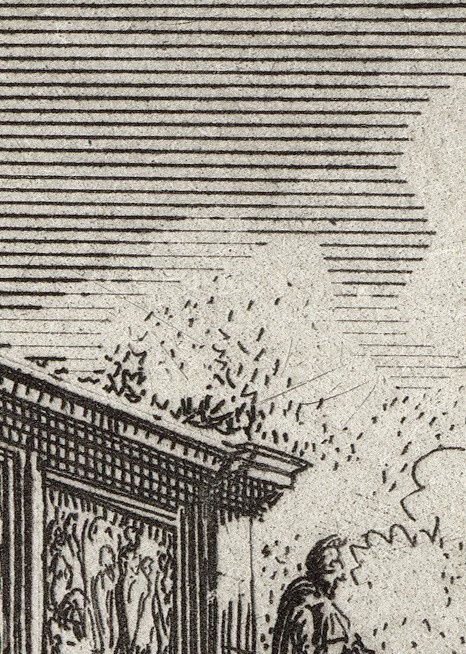 use of a shadowy foreground. 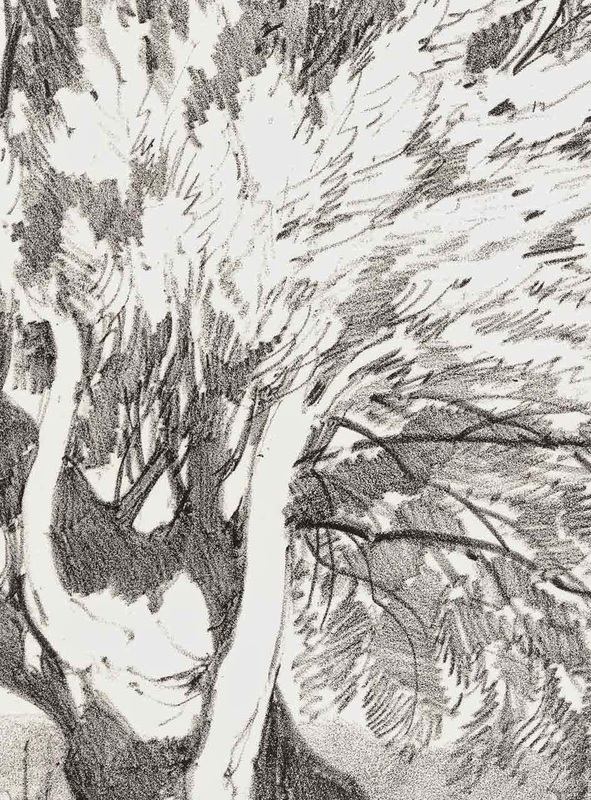 Before addressing both of these principles, however, I wish to metaphorically step back for a moment to point out a critically important issue regarding veduta imagery: the focal point in a scene is usually relatively small and is invariably disposed far into the distance. 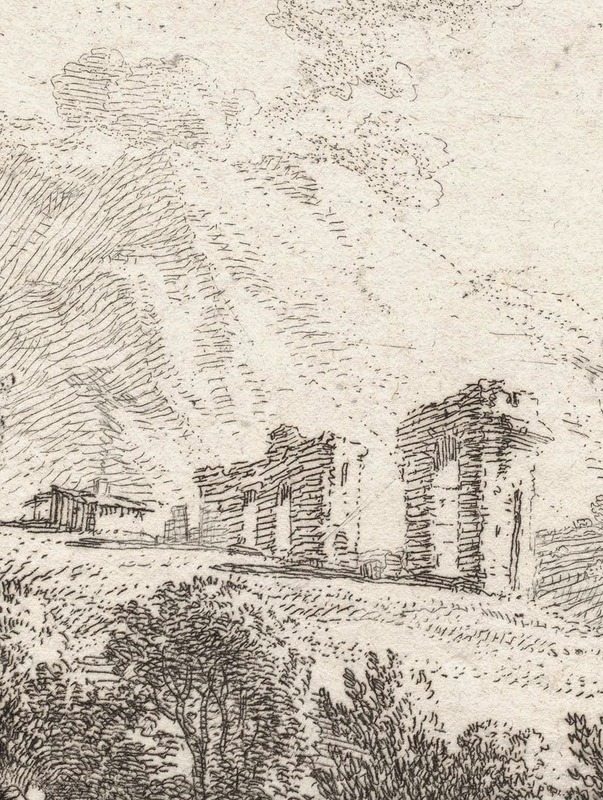 I mention this concern as when an artist is overly committed to portraying a landmark—whether this is a building, boulder or the activities of people or animals—there is a tendency to make the key point of interest too large in size for it to be seen in the context of a veduta (i.e. 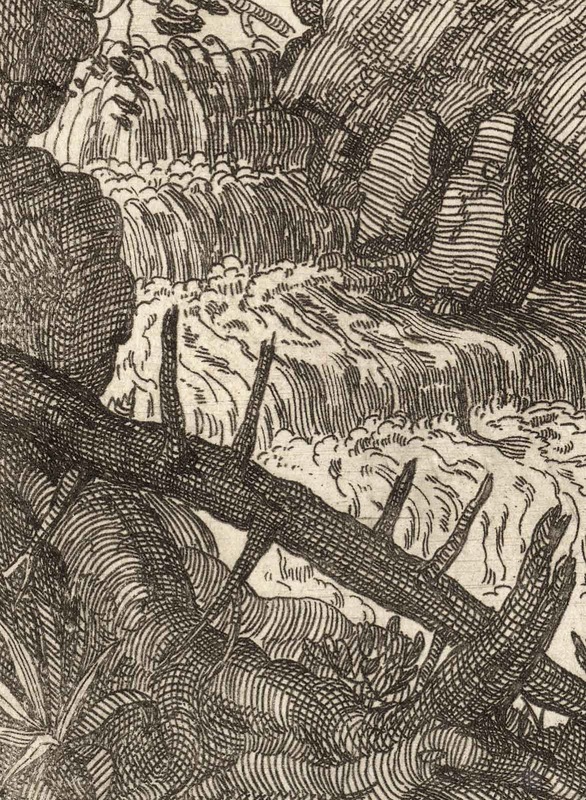 as an integral point of interest within an expansive view). 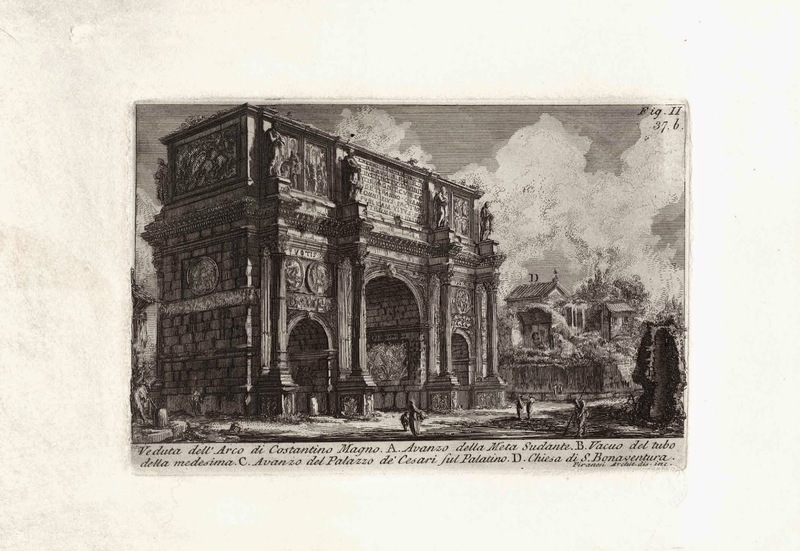 For example, in Giovanni Battista Piranesi’s (1720–1778) etching, Veduta dell'Arco di Costantino Magno (shown below), the portrayed triumphal arch occupies most of the composition resulting in a viewer’s attention being riveted on the arch rather than seeing it in the context of a broad vista. 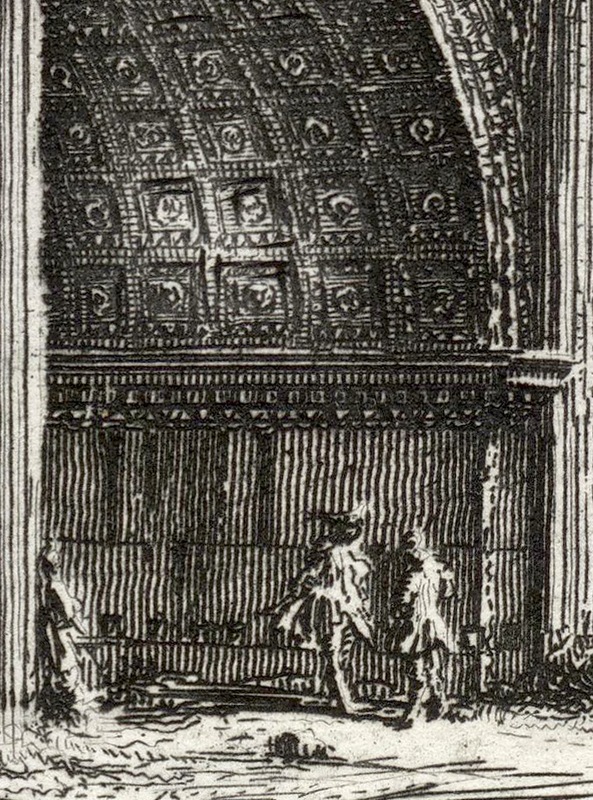 Etching on heavy wove paper with the Papal Calcografia Nazionale dry stamp (19th century) at lower-right corner. 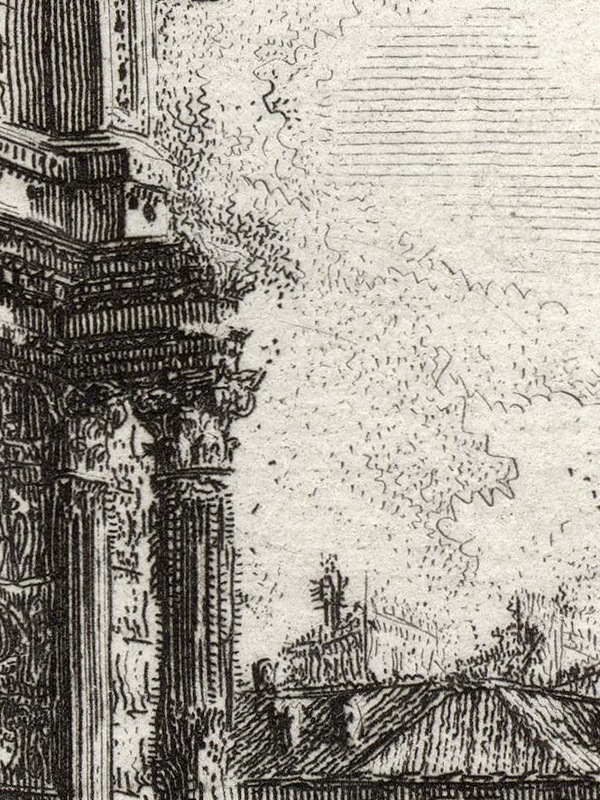 Condition: Richly inked nineteenth century Papal Calcografia dry stamped impression in good condition. There is light toning (perhaps dust?) 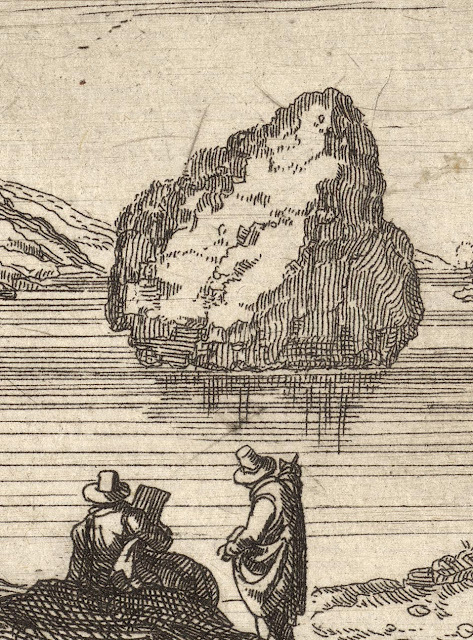 towards the left margin and I suspect that the print is trimmed smaller than it was issued with a 3.2 cm margin on its smallest edge. I am selling this etching for a total cost of $226 AUD including postage and handling to anywhere in the world. Please contact me using the email link at the top of the page if you have any queries or click the “Buy Now” button shown below. More recent, I remember reading advice from a digital concept designer warning that large space craft should not be represented in detail or they will not be perceived to be large. This is good advice. Moreover, it is equally applicable to the rendering of any massive subject and needs to be pasted about the working area of any architect who simply “has” to show where each nut, bolt, tile and window is located in a tower block. 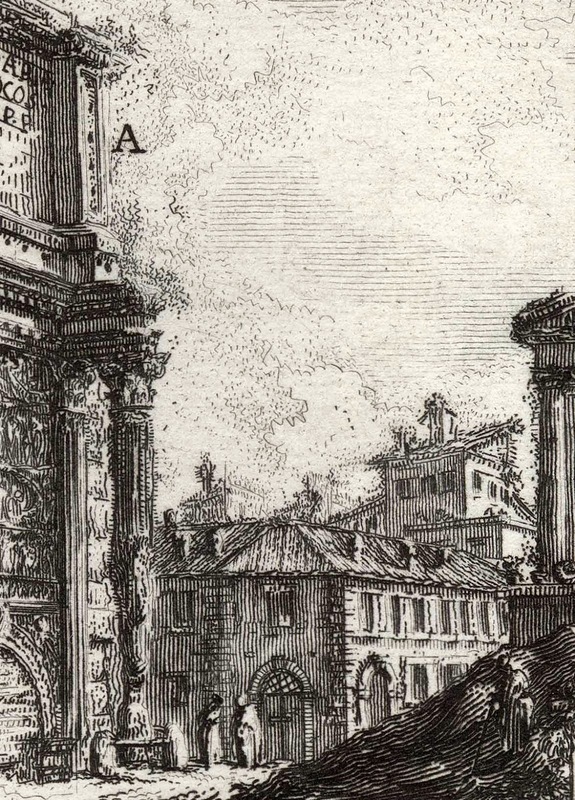 Before I leave this important point about veduta imagery, I wish to illustrate the effect of changing the scale of a key structure in an image. 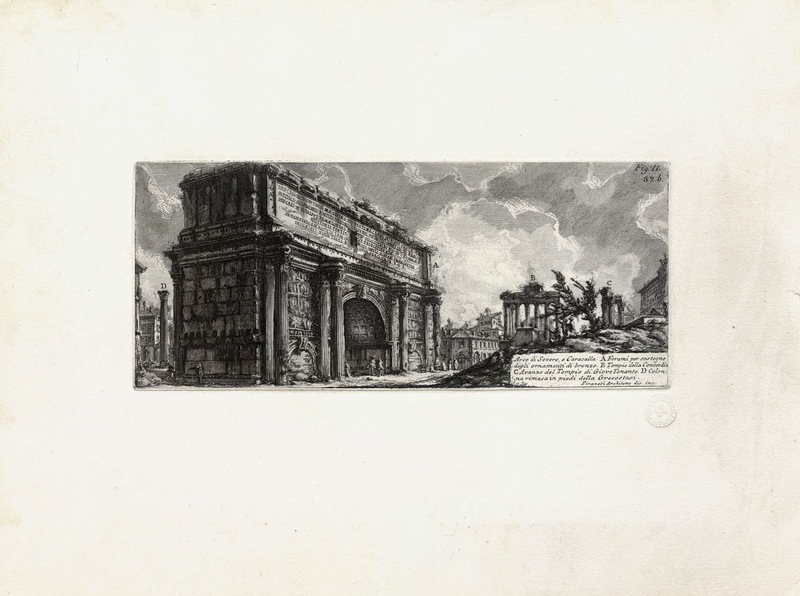 For this illustration I will use another of Piranesi’s prints focused on triumphal arches: Arco di Severo (shown below). 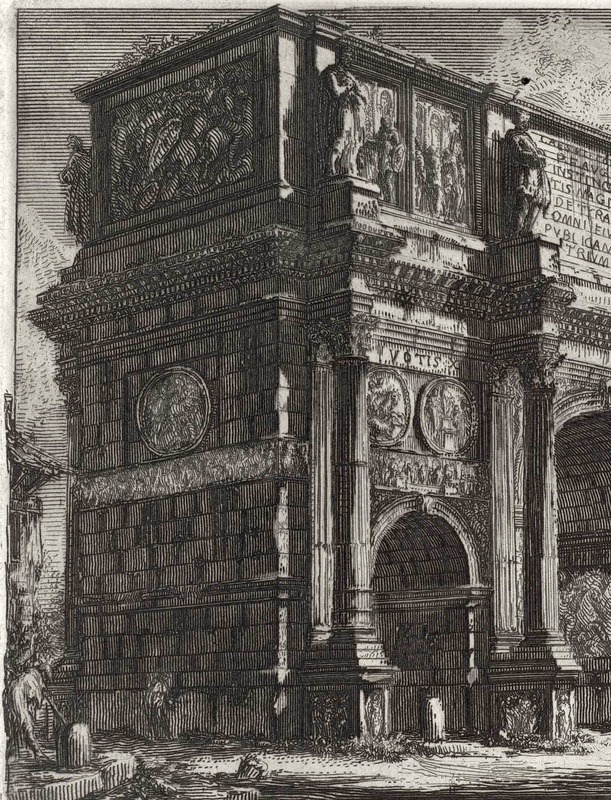 In this print, the placement of the arch is again in the foreground but this time its foremost corner is virtually pressed against the picture plane (i.e. 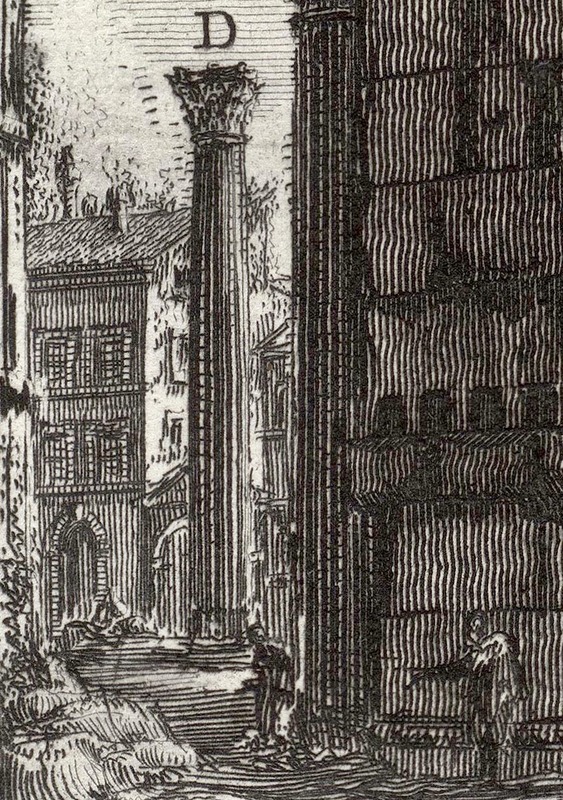 an imaginary vertical plane closest to the viewer’s eye). Condition: Superb strong nineteenth century Papal Calcografia dry stamped impression in good condition. There is a 1.5 cm closed tear on the left edge and scattered soiling in margins. I am selling this etching for a total cost of $236 AUD including postage and handling to anywhere in the world. Please contact me using the email link at the top of the page if you have any queries or click the “Buy Now” button shown below. 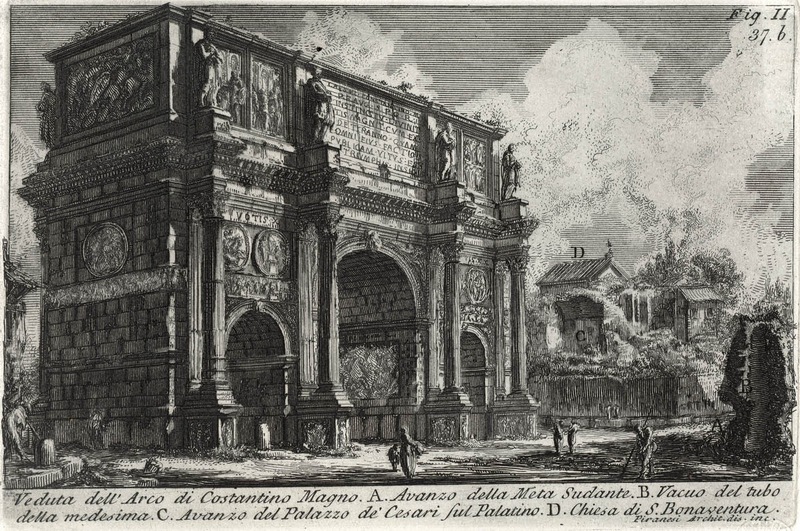 To demonstrate the effectiveness of creating the illusion of vast space by making the key feature in a veduta small in scale, I have digitally remodelled Piranesi’s Arco di Severo so that the arch is featured further into the pictorial distance, as shown below. Hopefully the comparison of this digital manipulation with the original composition shown above it is revealing. 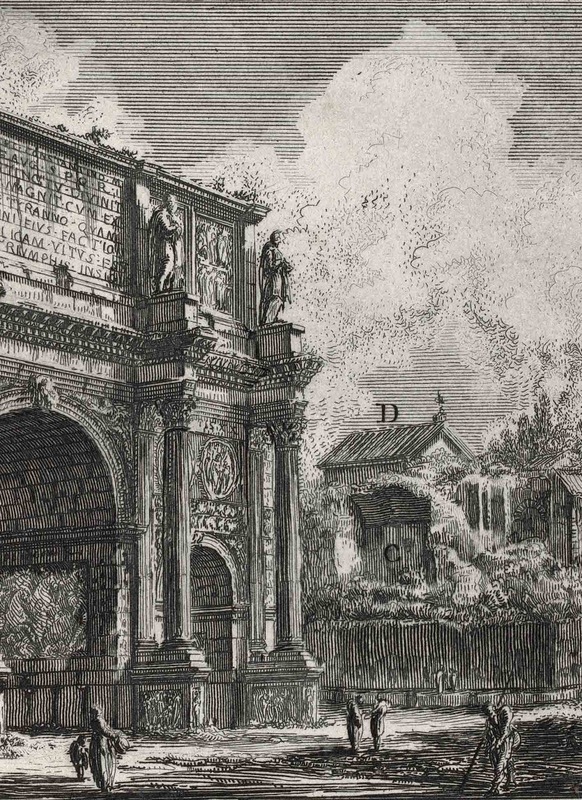 At this point, however, I must apologise to those who are familiar with the surrounding structures of the Forum Romanum where this arch may be found. 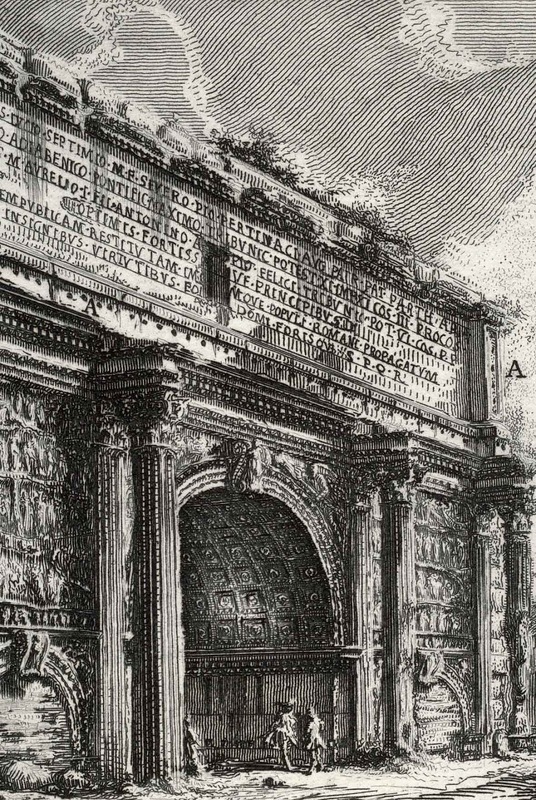 Clearly I have borrowed architectural features from other Piranesi prints rather than attempting to duplicate any of the architectural features of the forum and their disposition within the site. 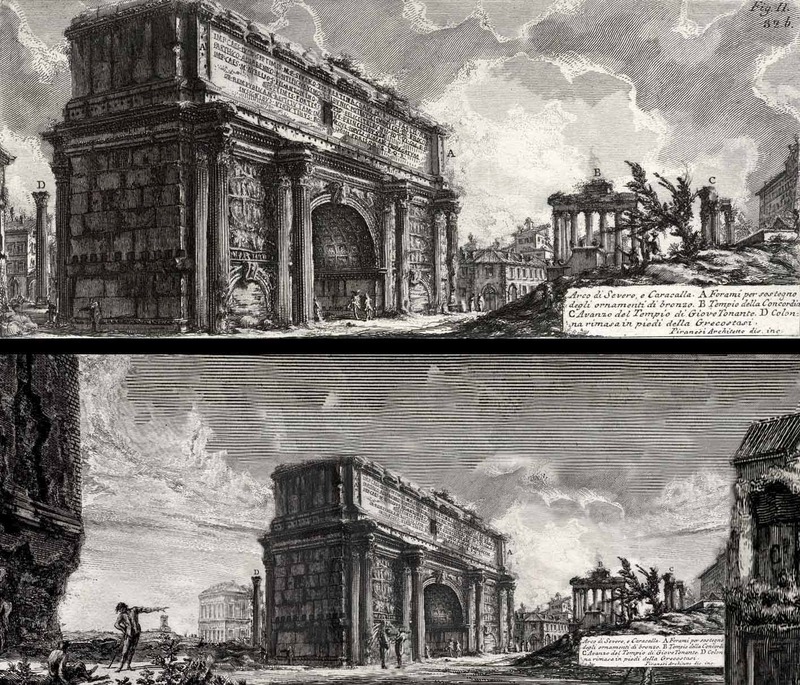 In short, my interest in the digital modifications to Piranesi’s print is more about exploring composition rather than any attempt a factual representation. Moving to the first of the principles that I wish to address in this discussion (viz. 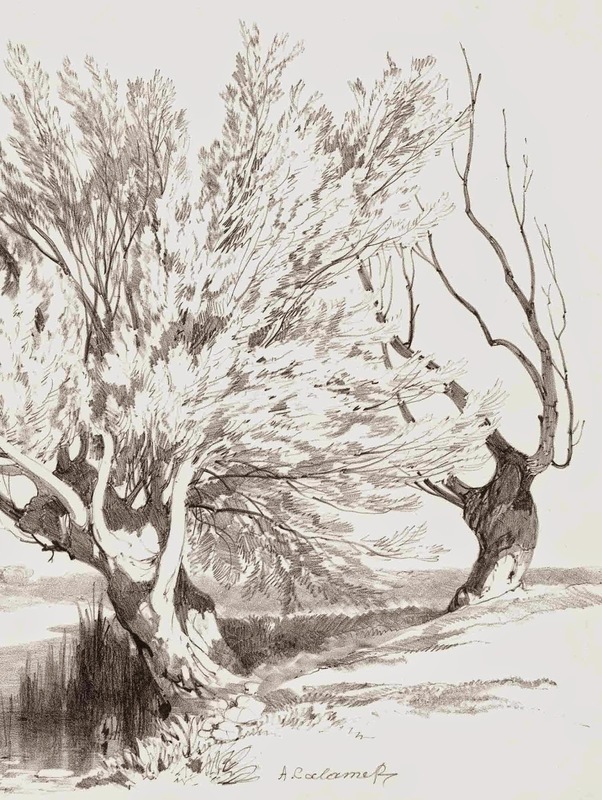 “use of an upward rhythm on the right of an image”), this is a key principle that usually underpins most compositions because upward rhythms on the right help to constrain a viewer’s eye from moving out of compositions. 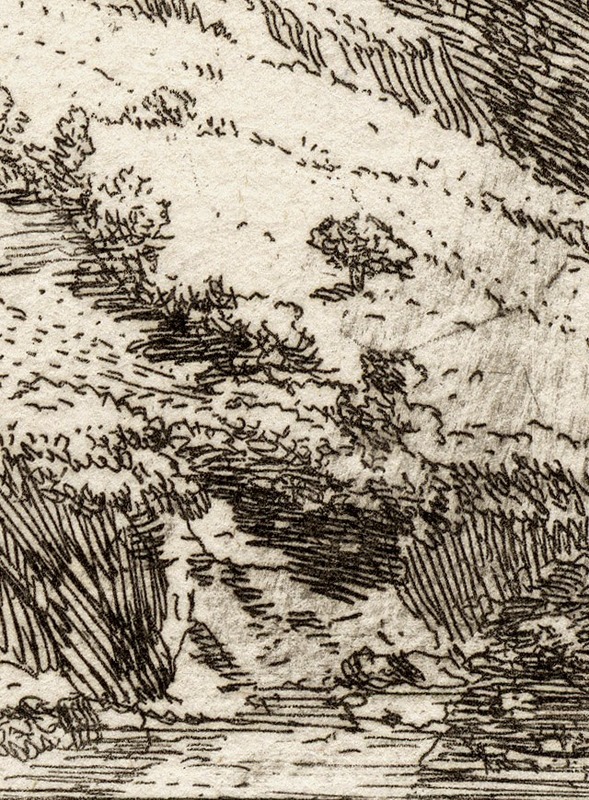 For example, either by intuition or by training, few Western artists would design a composition with a hillside that leads downwards at the right side of an image. 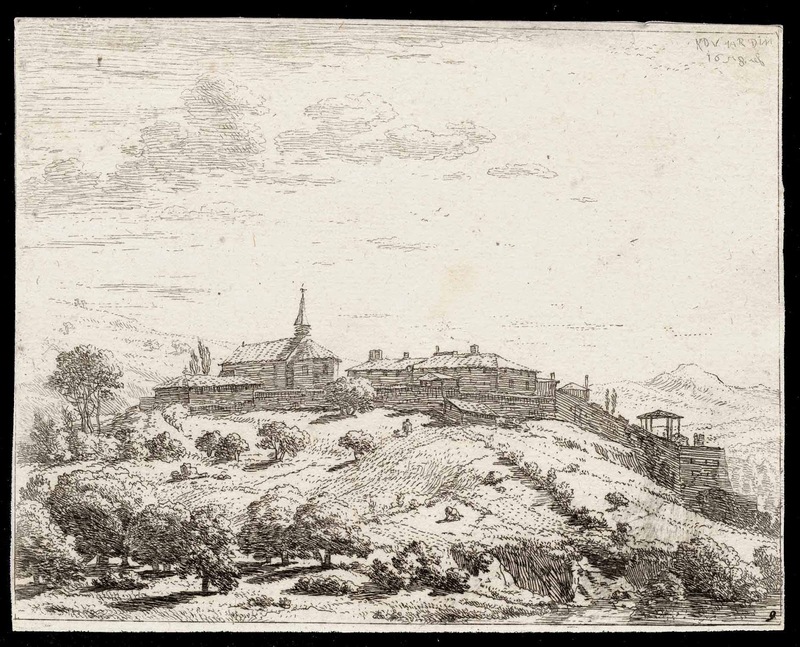 Nevertheless, not all artists abide by this unwritten rule as illustrated very well in Karel Dujardin’s etching, Le bourg à la montagne [Market town on a hilltop], shown below. 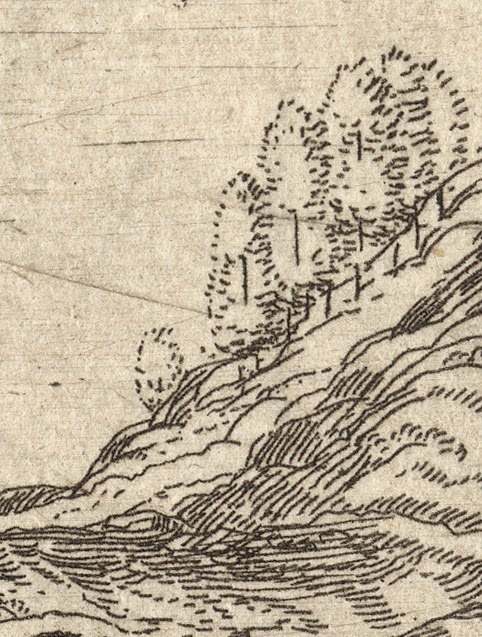 Indeed, artists invariably manipulate their designs so that the hillsides on the right edge are cropped (i.e. 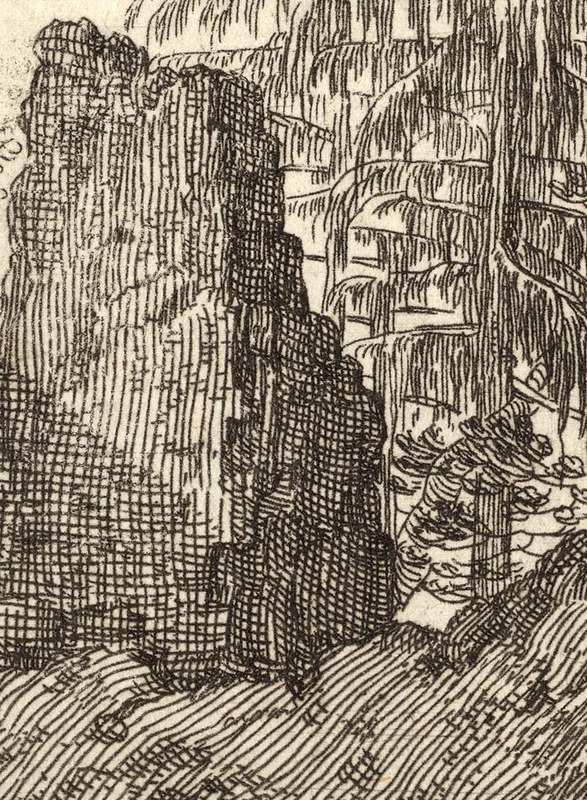 “cut” by the image edge) so that only the upward slope of a hill is portrayed. 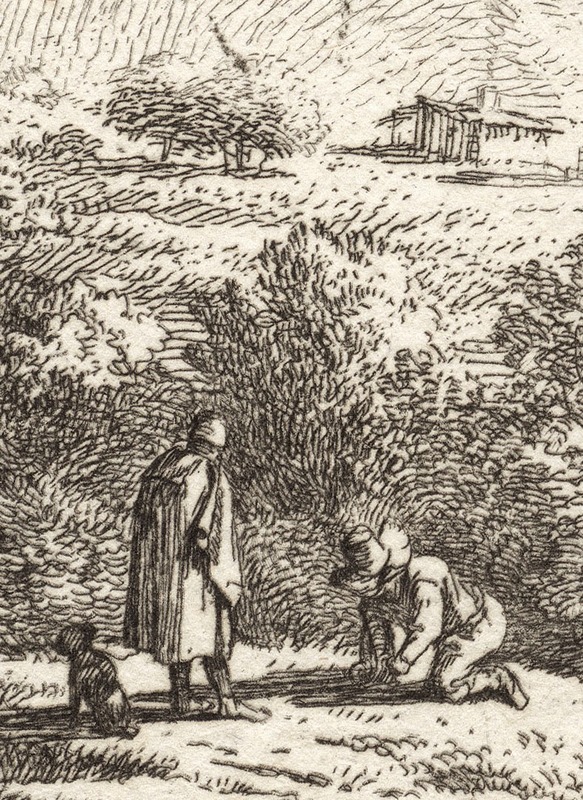 Again, as an example of use of an upward slope see Dujardin’s L’homme qui se chausse [Landscape with a man tying his shoe], shown further below. Condition: Good impression trimmed at plate mark and in near pristine condition. 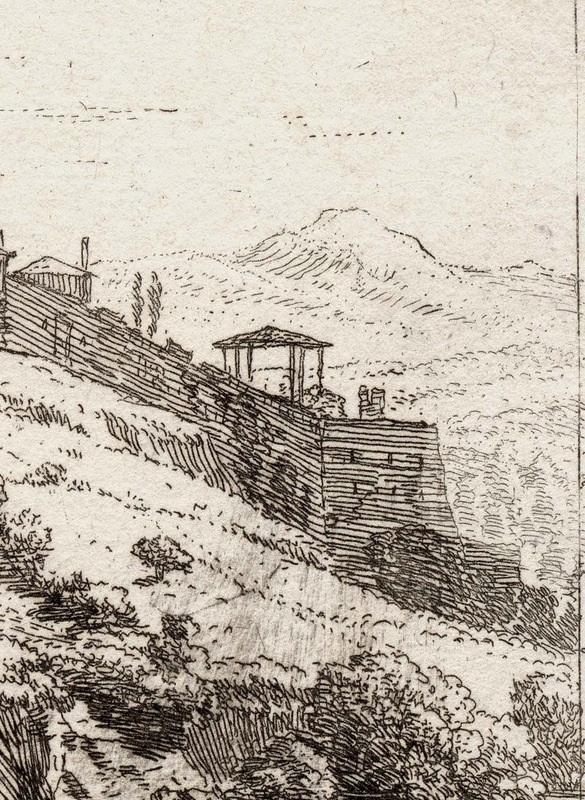 I am selling this etching and the Dujardin’s shown below (i.e. 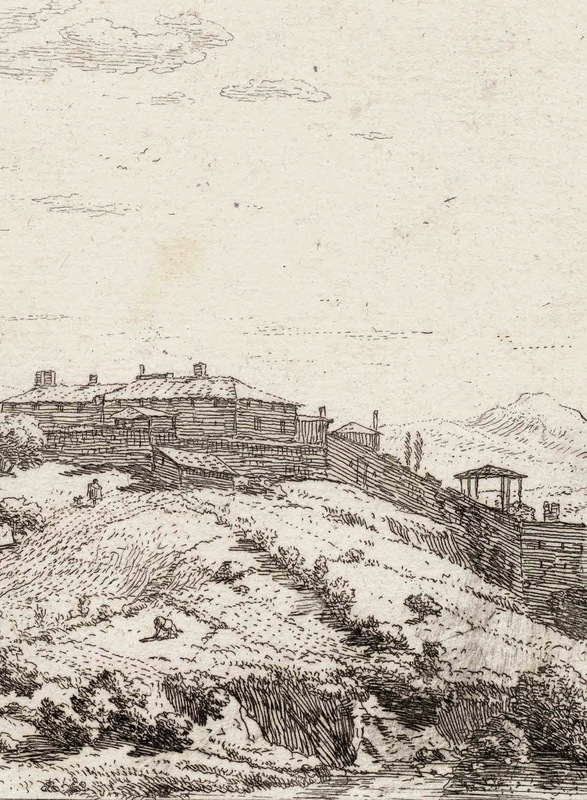 Le bourg à la montagne and L’homme qui se chausse) for a combined total cost of $234 AUD including postage and handling to anywhere in the world. Please contact me using the email link at the top of the page if you have any queries or click the “Buy Now” button shown below. Condition: Good impression trimmed at plate mark and in near pristine condition. 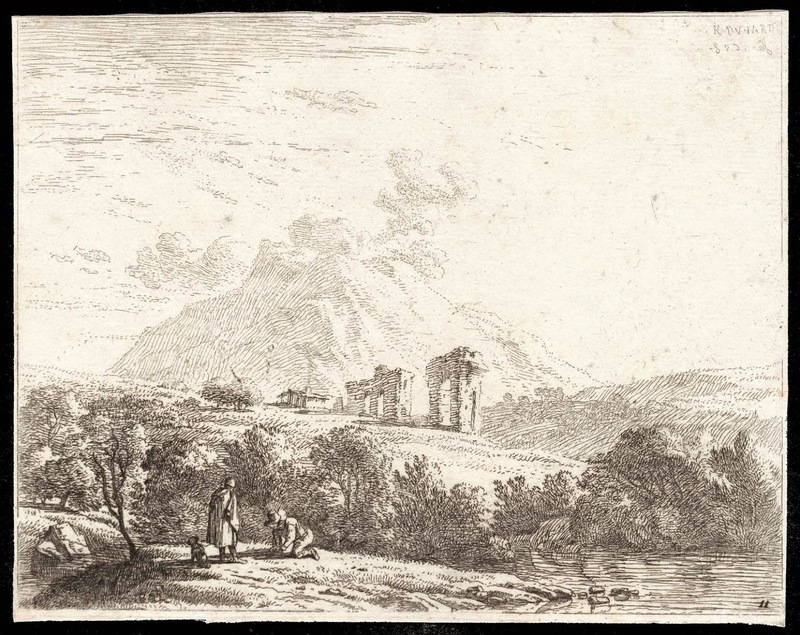 I am selling this etching and the Dujardin’s shown above (i.e. L’homme qui se chausse and Le bourg à la montagne) for a combined total cost of $234 AUD including postage and handling to anywhere in the world. 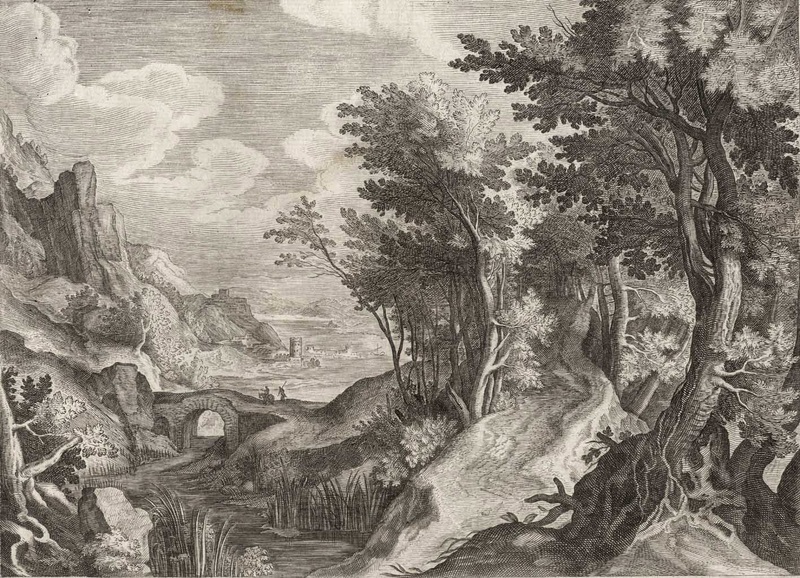 Please contact me using the email link at the top of the page if you have any queries or click the “Buy Now” button shown above (see Dujardin’s Le bourg à la montagne). To clarify the difference in the directions of the two rhythms I have digitally added red lines to both prints as shown below. The highlighted downward rhythm of upper print, Le bourg à la montagne, I argue allows a viewer’s eye to “fall” out of the composition. By contrast, the upward rhythm of the lower print, constrains the eye from moving outside of the composition and hopefully demonstrates the importance of this often applied rule of composition. 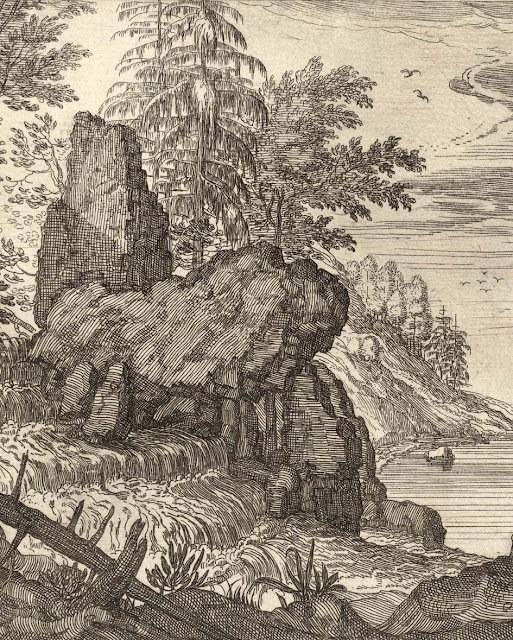 Of course, an upward rhythm on the right side of an image also helps to frame a vista as shown below in Aegidius Sadeler II’s (1570/75–1629) engraving, Rocky River Landscape in Bohemia with Multilevel Waterfall (after Roelandt Savery). 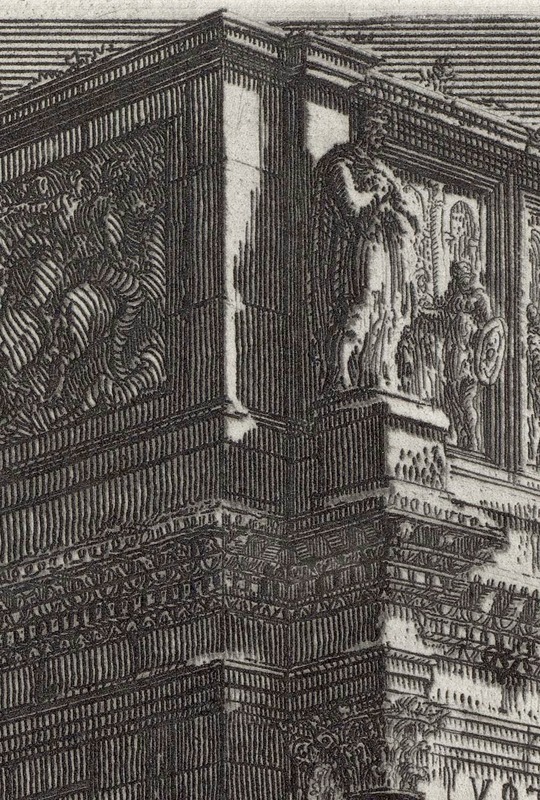 Nagler 222–226; not in Bartsch. 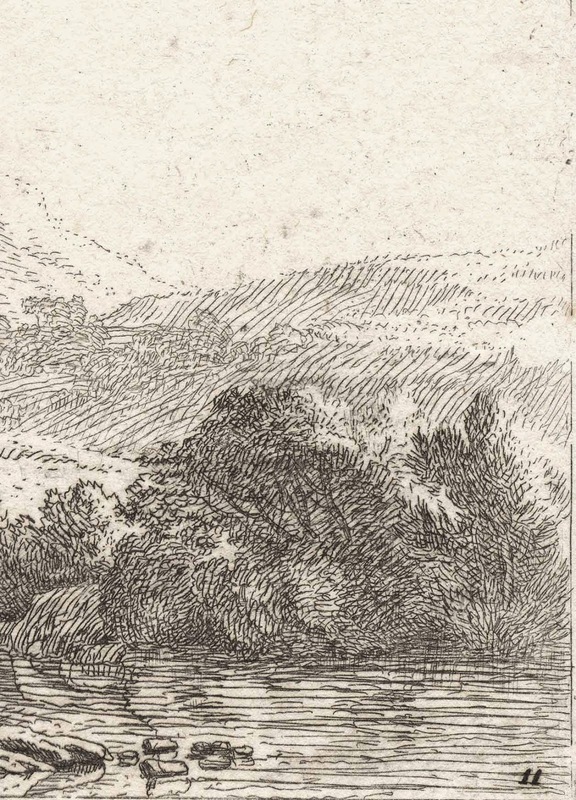 Condition: excellent impression, trimmed along the platemark, with traces of mounting (verso) and a small backed tear at the lower-left edge. I am selling this engraving for a total cost of $206 AUD including postage and handling to anywhere in the world. Please contact me using the email link at the top of the page if you have any queries or click the “Buy Now” button shown below. 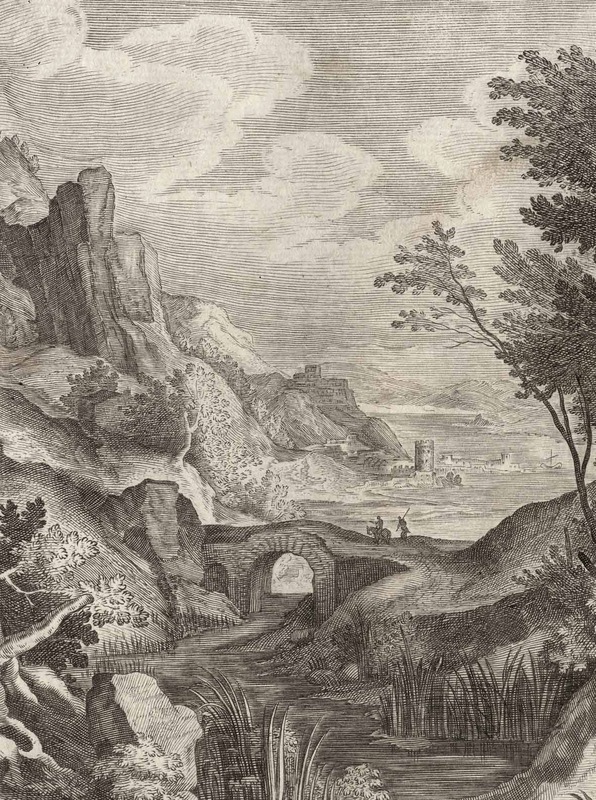 Here, the portrayed landscape is pictorially framed by the countering directions of the downward rhythms of the rocky terrain on the left side of the image and the upward rhythm of a distant hillside featured on the right. 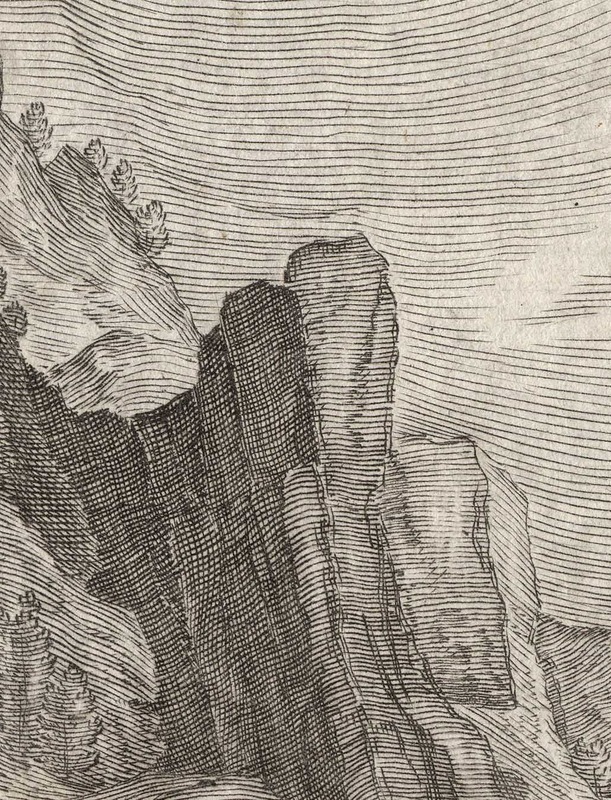 Further enhancing the upward angle of this hillside is the tilted angle of a foreground tree stump leaning to the right and the upward angles in the cloud formation (see diagram of these upward rhythms shown below). 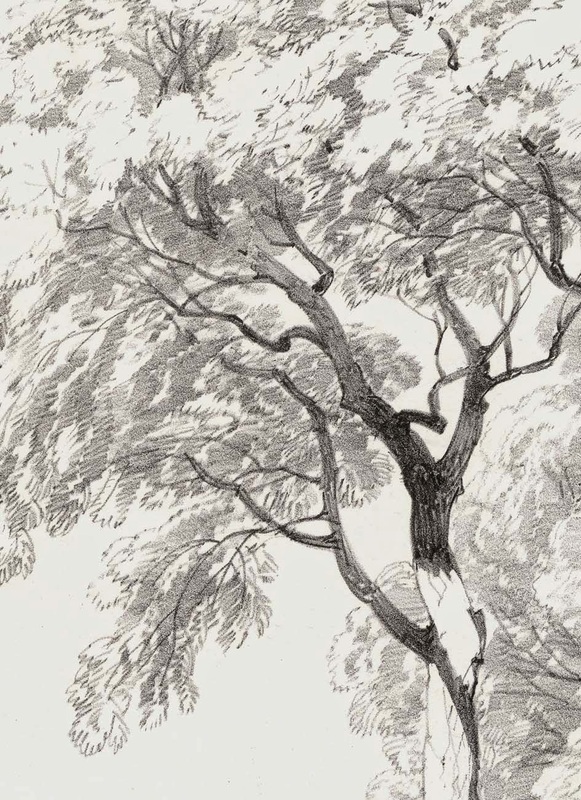 The downward rhythms on the left that invite the eye to “fall” into the composition and the upward rhythms on the right that act as a visual “brake” in slowing the viewer’s eye from drifting out of a composition also limit what a viewer is invited to see. 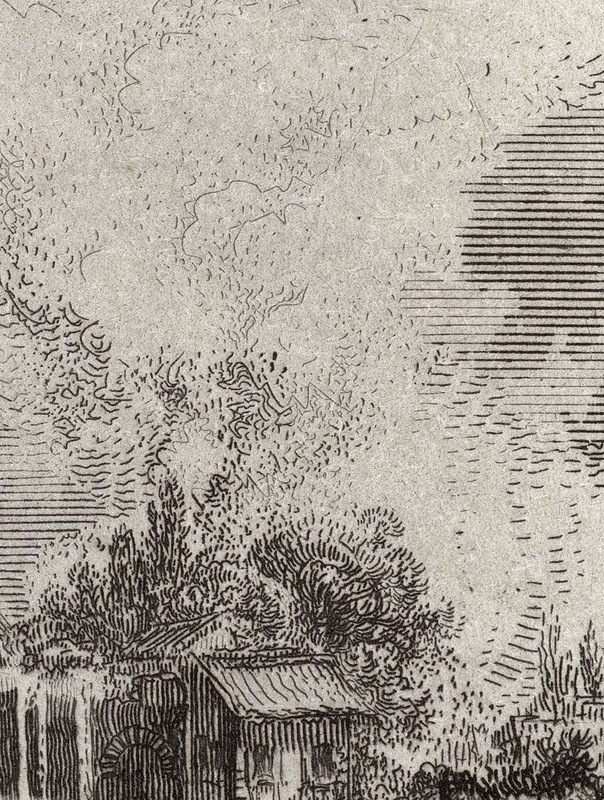 After all, both rhythms help to focus a viewer’s attention on the centre of the image. Accordingly, to encourage viewers to imagine more of a scene than what is presented, the downward rhythms on the left need to be minimised. A fine example of how an artist has minimised—i.e. 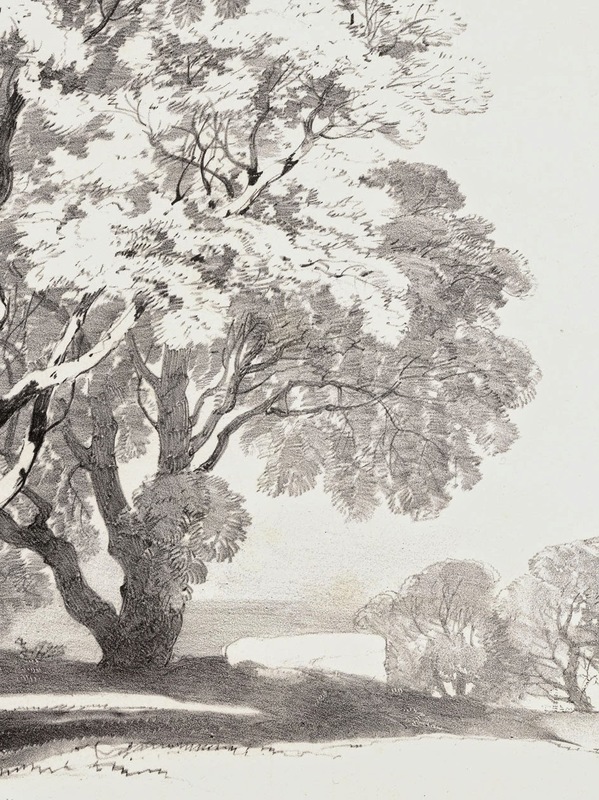 “played down”—descending rhythms on the left while maintaining upward rhythms on the right side of an image is Alexandre Calame’s (1810–64) lithograph of a Willow, Leçons de Paysage (shown below). 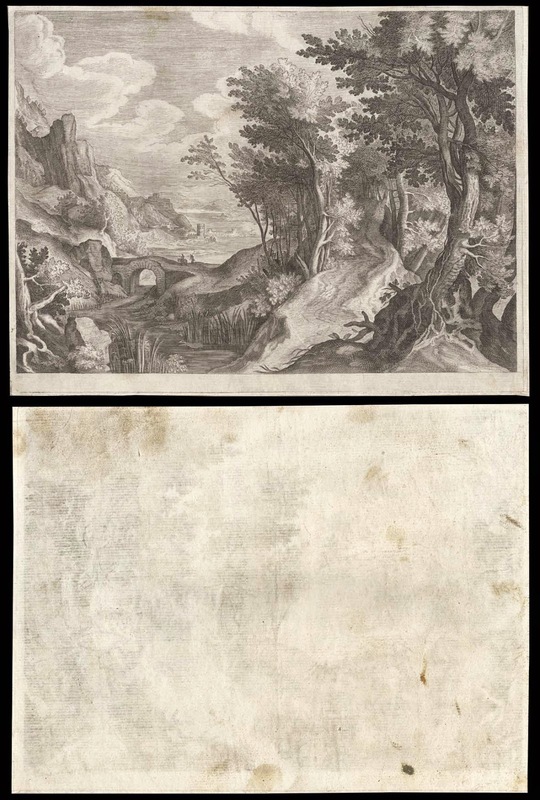 Here, the background on the left side of the image is portrayed as a largely horizontal plane with minimal suggestions of downward rhythms. 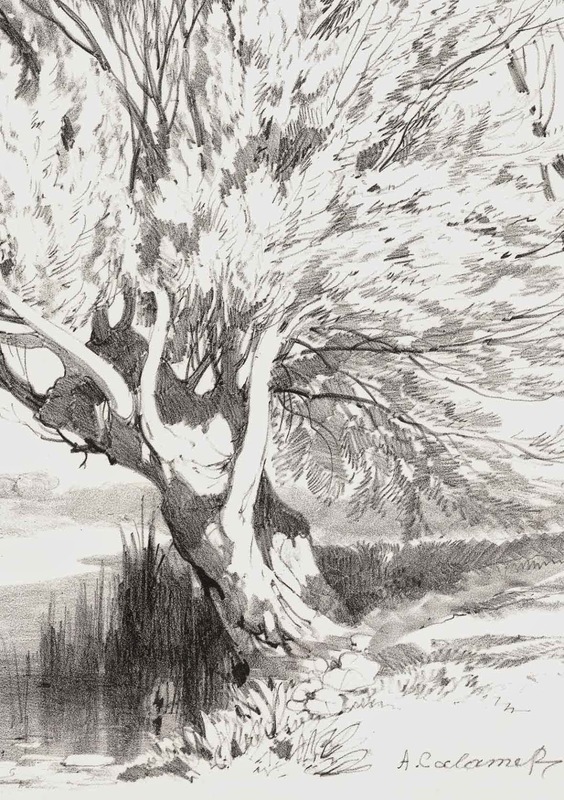 Like all great artists, however, Calame is still cognisant of the need to catch and engage the viewer’s eye. Condition: excellent impression with no foxing or stains and minimal signs of handling, but with a small (1.5 cm) closed tear at the upper edge. I am selling this lithograph for a total cost of $136 AUD including postage and handling to anywhere in the world. Please contact me using the email link at the top of the page if you have any queries or click the “Buy Now” button shown below. 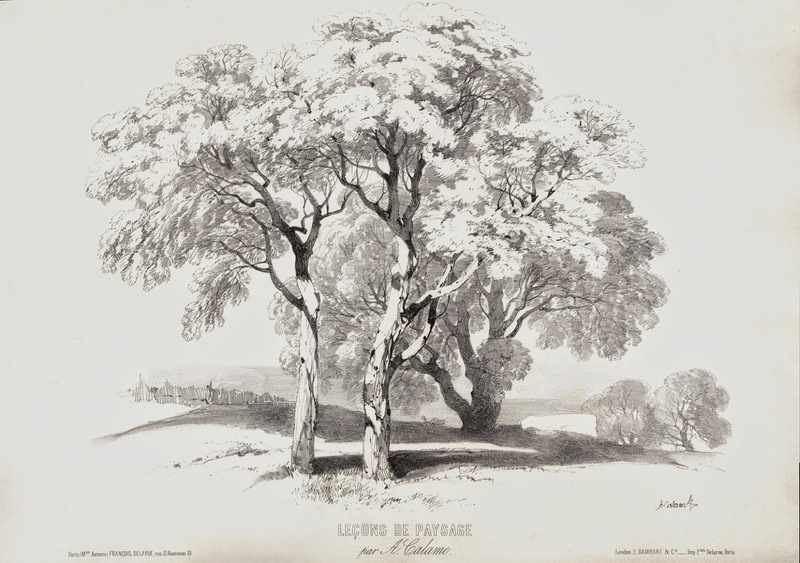 In short, I wish to propose that the horizontal rhythms describing the background on the left side of this print, along with the downward sweep of foliage on the same side, serve to invite the viewer’s eye into the compositional heart of the image: the tree at the centre of the scene. 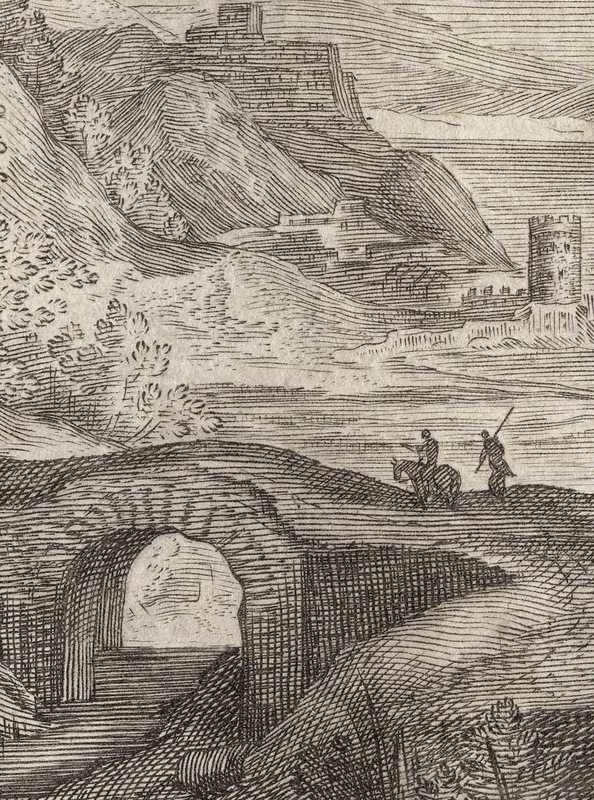 Going further, the largely horizontal lie of the land in the background also subliminally suggests that there is a much more expansive view of the surrounding landscape on the viewer’s left than is actually portrayed. 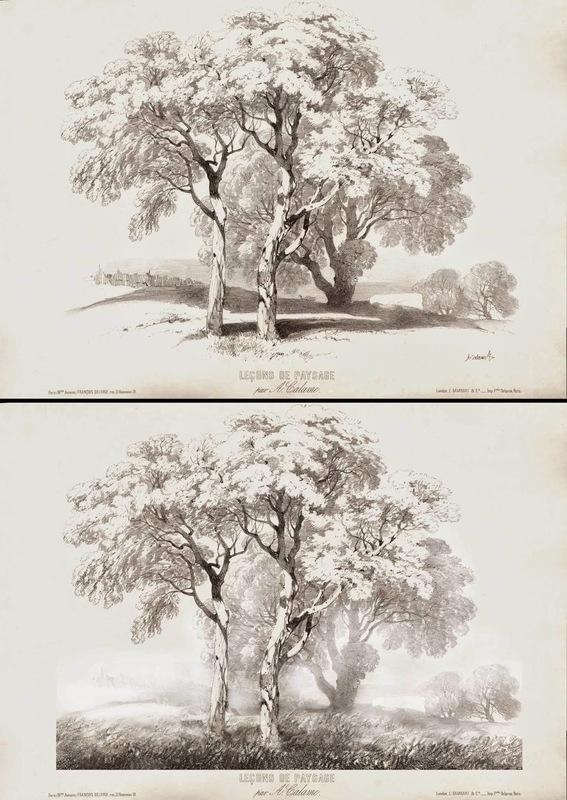 To illustrate the difference between Calame’s approach and the more traditional approach of framing a scene with downward rhythms on the left side, I have digitally modified the lower of the two images of Calame’s lithograph shown below with the traditional approach of employing downward rhythms. 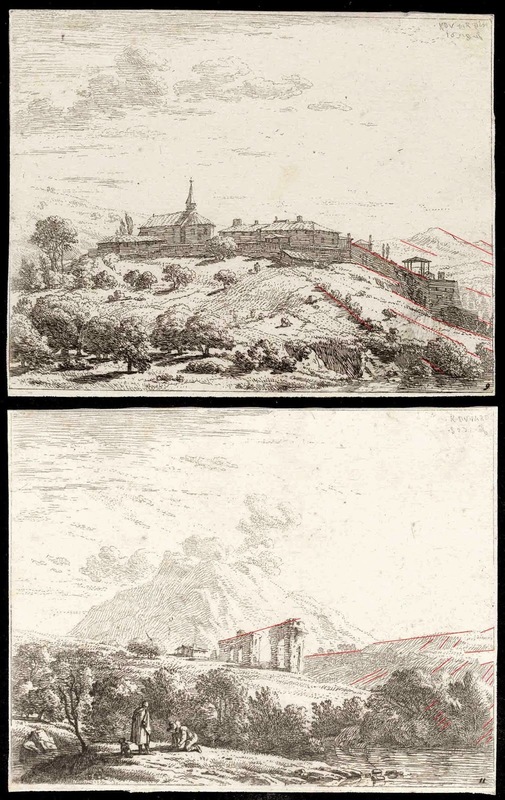 Hopefully this comparison of the two versions will demonstrate that minimising downward rhythms on the left side is effective in helping to connote scenic expansiveness. 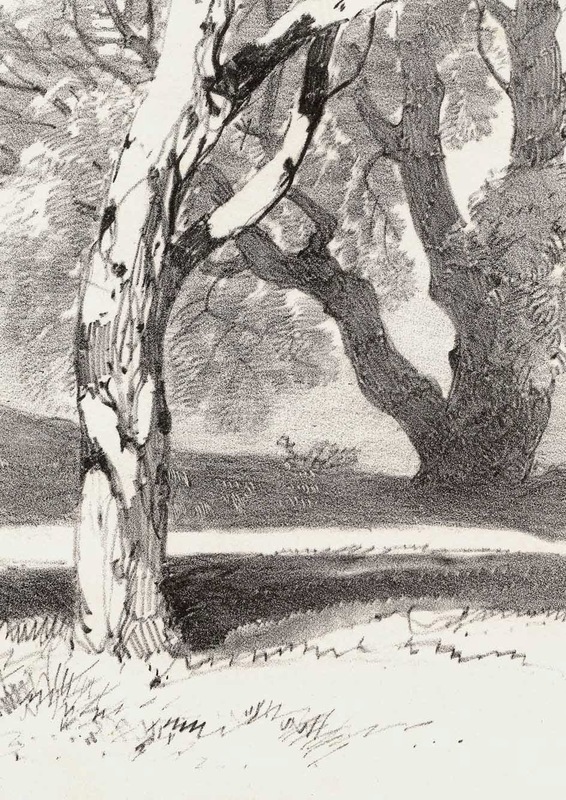 Regarding the second principle—use of a shadowy foreground—to project notions of vastness, I first need to raise a brief but important issue discussed in the earlier post, “Roupossoir Devices” (see http://www.printsandprinciples.com/2013/05/repoussoir-elements-corot-van-blerk-and.html) concerning the affect of the artist’s location in a landscape when creating artworks. Essentially, in cold countries artists tend to sit in the sun in order to keep warm when creating artworks out-of-doors. 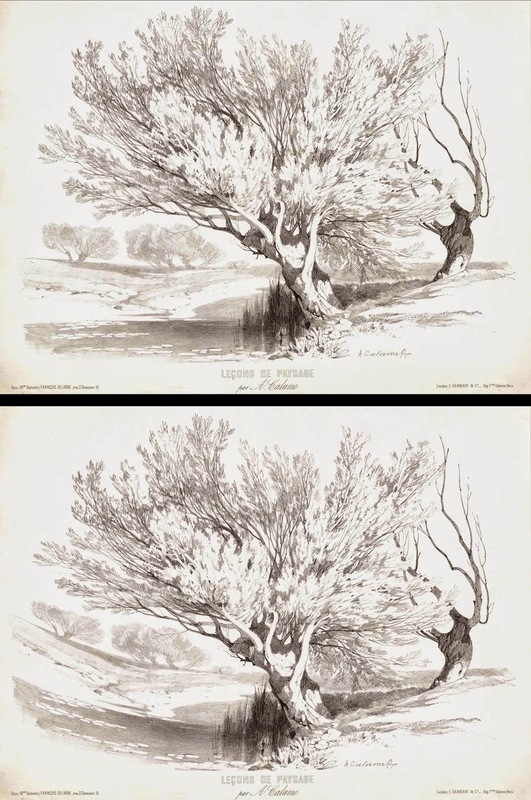 The affect of this common sense solution to keeping warm while in the cold outdoors often results in the foregrounds of images replicating the same sunny outlook where the artists worked. Although this simple outcome of an everyday reality should not be a problem, unfortunately, it often is. This is because a portrayed sunny foreground in an image is counterproductive to portraying the illusion of deep space. 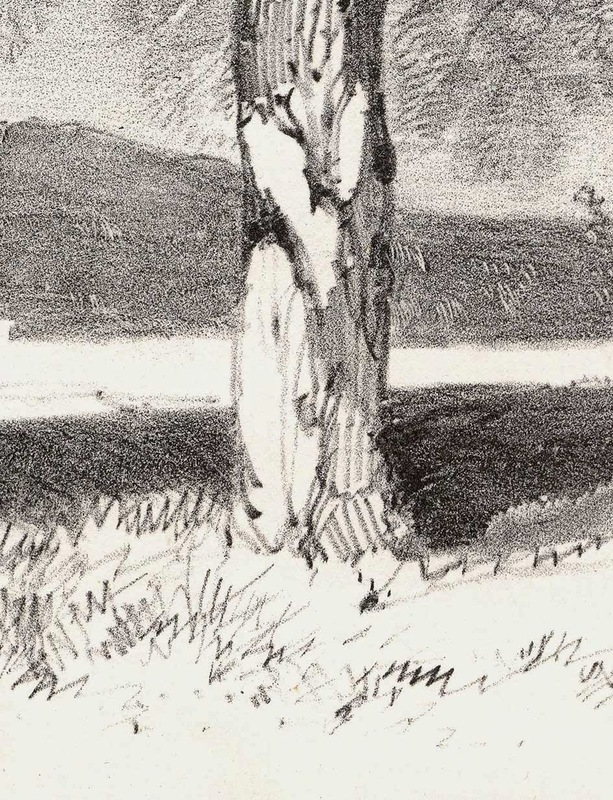 Or to express this slightly differently, if artists wish to create the illusion of deep space then they should ensure that the foreground of their images is dark in tone (i.e. shadowy) and the background/distance is light in tone (i.e. sunlit) rather than truthfully depicting the reality of their immediate sunlit surroundings. 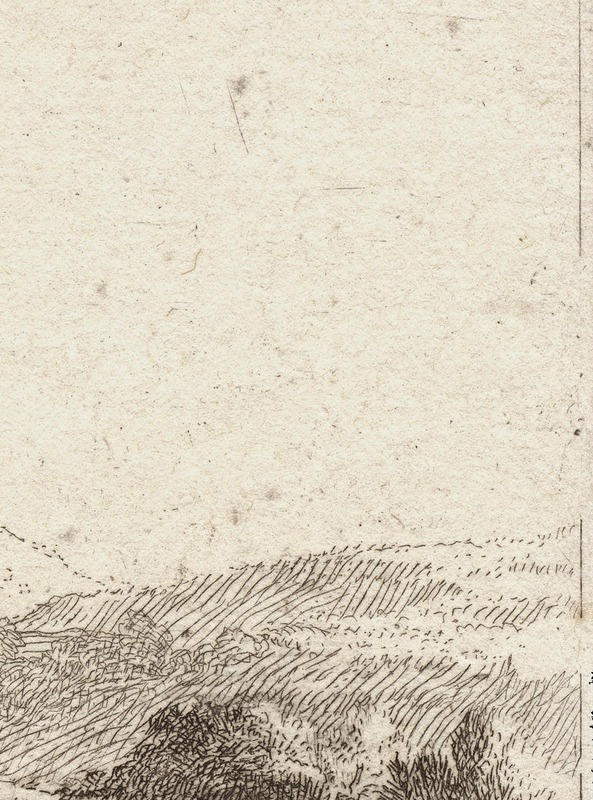 In fact one of the simplest ways of achieving the illusion of deep space is to keep the foreground dark (i.e. shadowy) and the background/distance light (i.e. sunlit). 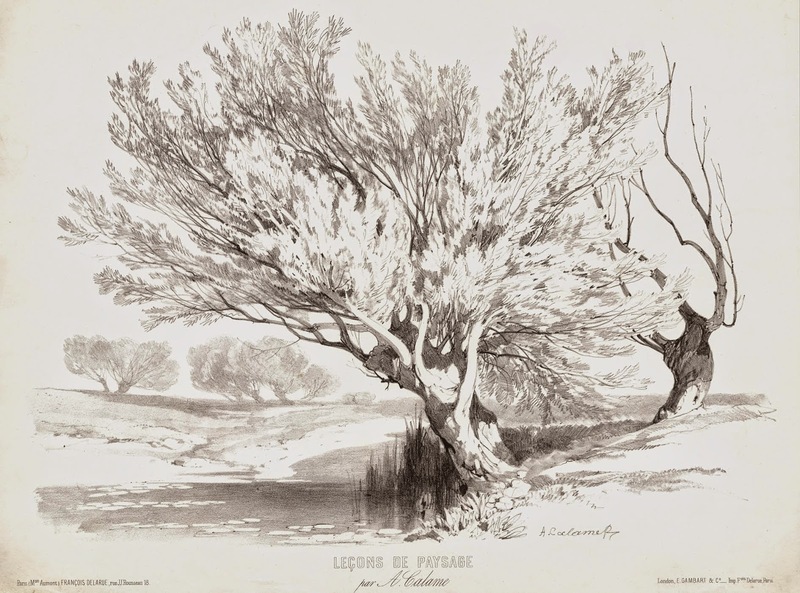 For example, in Calame’s lithograph Leçons de Paysage [Two Trees in Sunlight] shown below, the artist drew his subject from a sunny position as he also did in Leçons de Paysage [Willow]. 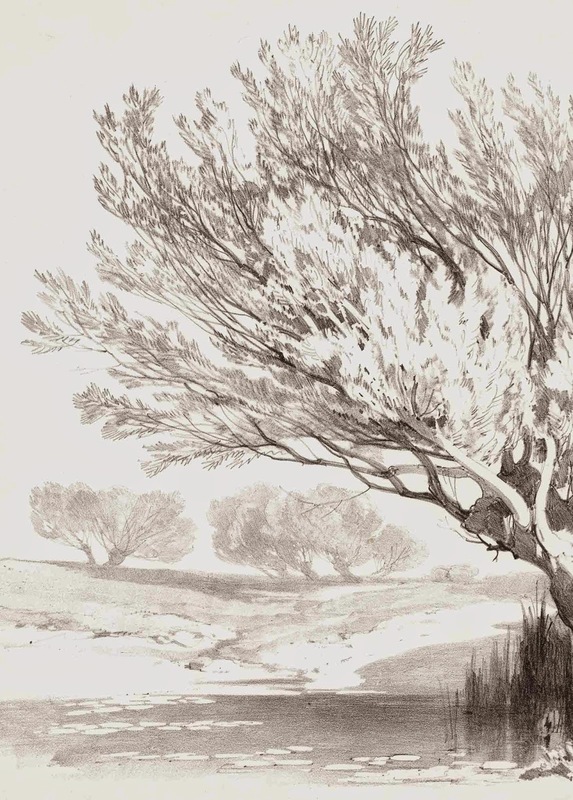 Calame is such a fine artist, however, that he overcame this perceptual problem of creating a light foreground by clever use of strong contrasts of light and shade to create an arresting foreground that is very different to the softly toned distance. Condition: superb impression in near pristine condition. I am selling this lithograph for a total cost of $136 AUD including postage and handling to anywhere in the world. Please contact me using the email link at the top of the page if you have any queries or click the “Buy Now” button shown below. 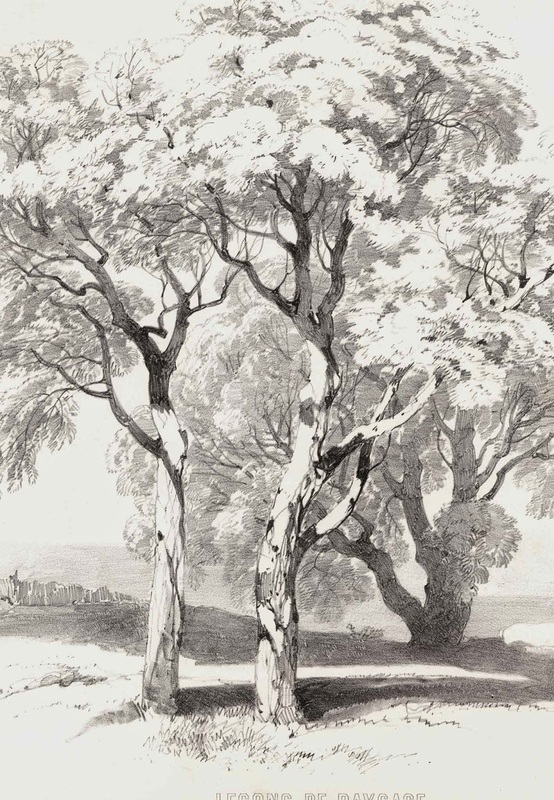 To demonstrate how a dark foreground will give the illusion of a far greater depth of space I have digitally manipulated Calame’s Leçons de Paysage [Two Trees in Sunlight] and replaced the sunny foreground with a shadowy one as shown in the lower image below. 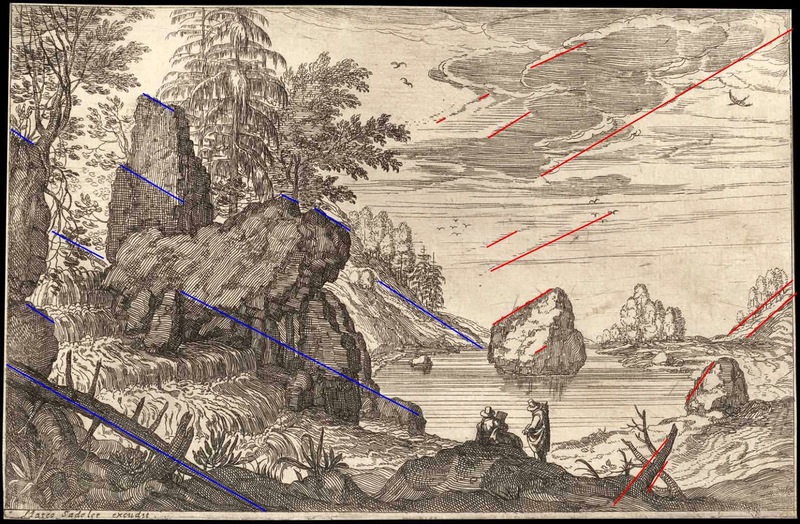 Even though the aim of the above demonstration was to illustrate in a schematic way how dark foregrounds in scenes give spatial depth (i.e. 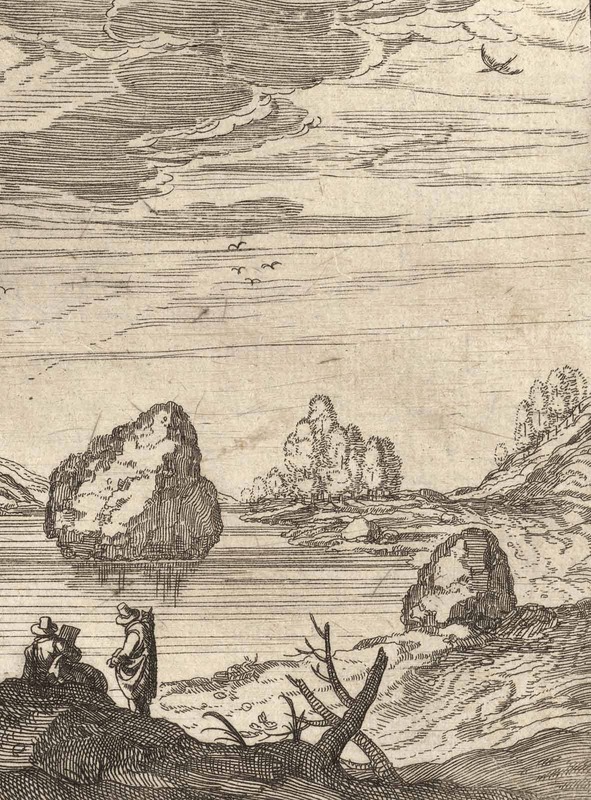 pictorial vastness), in reality, the surface terrain of an observed landscape is inevitably punctuated with patches of light and dark. 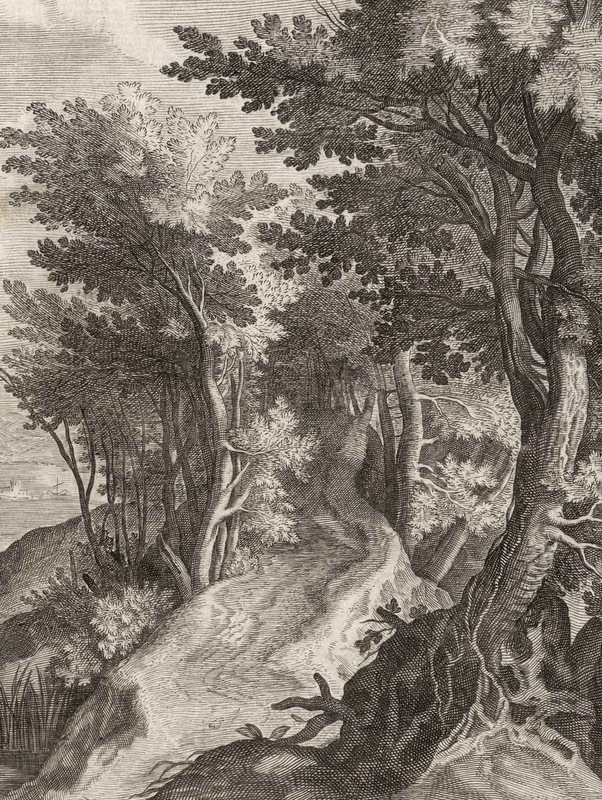 To conclude this discussion, I have chosen to return to the engraved landscapes by Aegedius Sadeler and to showcase his superb print, Wooded Ravine with Distant Harbour View (shown below) as an example of how a master printmaker is able to tinker with the irregular arrangement of lights and darks to suggest a depth of space that stretches to infinity. 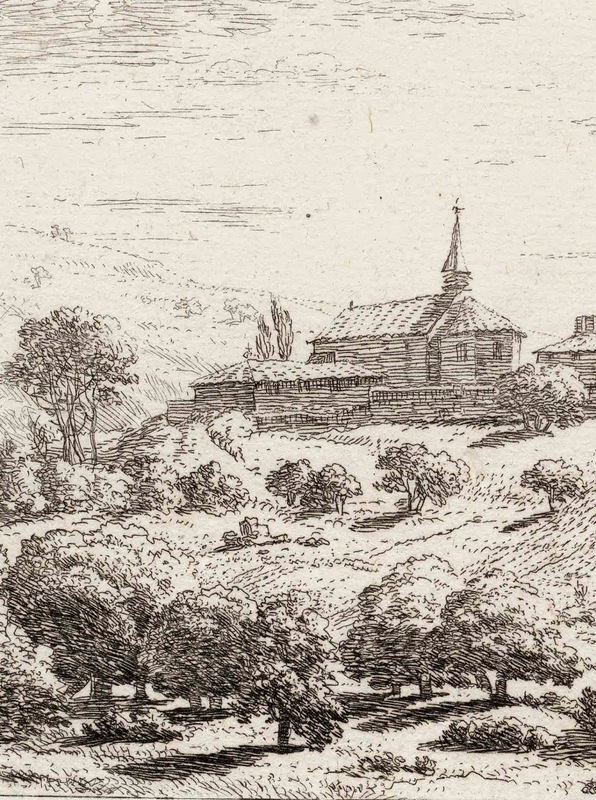 Bartsch 7201.281; Hollstein 1980 vol. 21, Add. 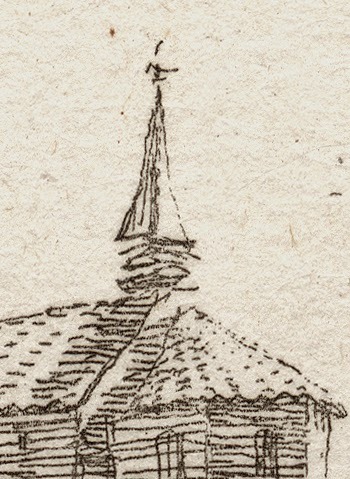 2; Stampfle, pp. 23 and 24. Condition: rare crisp impression with narrow margins and in excellent condition for its age. 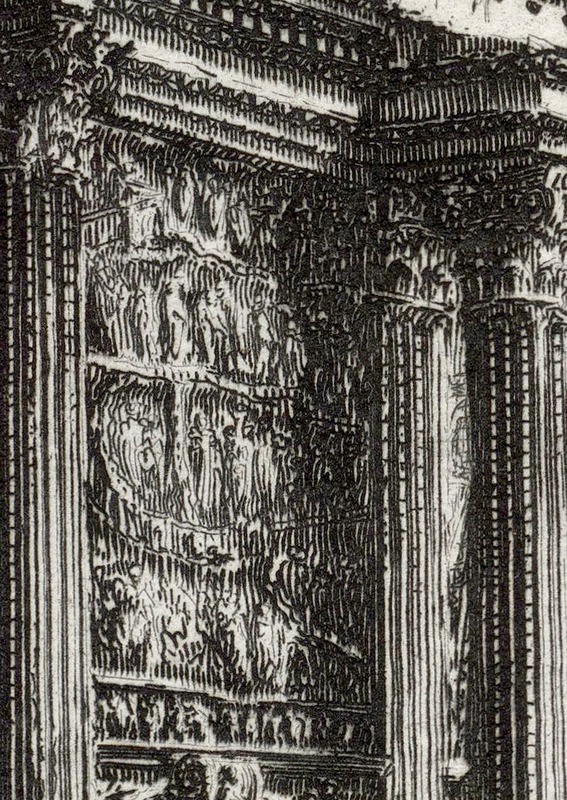 Nevertheless, there is a small (1 cm) stain at the top edge (recto) and there are traces of use in terms of finger marks and touches of soiling (verso). I am selling this print for a total cost of $226 AUD including postage and handling to anywhere in the world. Please contact me using the email link at the top of the page if you have any queries or click the “Buy Now” button shown below.